Philadelphia, PA – It was blue and white and seen all over the world, live on the internet for the first time. Here in Philadelphia, the Greek Independence Day Parade celebrating the 196th Anniversary of Greek Independence marched down Benjamin Franklin Parkway and radiated Hellenic pride. Thousands of Greek-Americans flooded the City of Brotherly Love to participate and see the world-famous Presidential Guard, the Evzones, from Greece. With City Hall in the distance at one end and the Philadelphia Museum of Art on the other, the parade kicked off with a short ceremony under the Greek flag, which is part of the hundreds of flags from each country lining the Parkway. There, dignitaries honored guests, and the marchers joined together to celebrate and remember the War of Independence that liberated the Hellenes from under the tyrannical yoke of the Ottoman Empire. Each Greek-American organization and Greek Orthodox church were announced in both English and Greek by Federation members, Stathis Karandonis and Judge Harry Karapalides, who have been the parade MCs for the past many years. 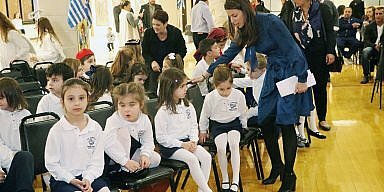 From the oldest church in the Delaware Valley – Annunciation of Elkins Park, to the youngest organization – The Philadelphia Greek Basketball League, the Greek community was united for the day. The crowds at the grandstand cheered and waved to family members as Patrioti Brass Marching Band from New York played the familiar marching music. The Federation banner led the way and behind it, marched the parade Grand Marshals, Dimitrios and Georgia Halakos, the Eleftheria Medal recipient, Demosthenes J. Vasiliou, many Greek military members and politicians, Federation officers, and an entourage of other dignitaries and community leaders. Popi Karapalides from Seizmos Music sang the national anthems of both Greece and the United States, which was followed by a prayer, led off by his Eminence, Metropolitan Evangelos of New Jersey. Moments later, the Parkway fell silent as the Evzones marched through, the crowd then erupting in applause. 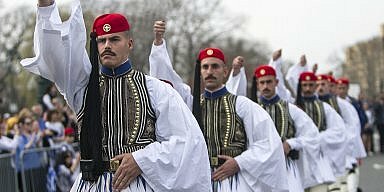 This special moment left Greeks speechless as the Presidential Guard fell into two lines for the parade to follow through. Standing at attention for the next few hours, they stood like the proud columns of the Parthenon as the Greeks of Philadelphia commemorated the day. The parade then commenced with the area churches coming first with their parish council members, the parish priests, banners flying high, Sunday School and Greek school teachers and their students, and the hundreds of parishioners, all waving Greek and American flags. Shouts of “Zito I Ellas!,” “Zito I Ethnos!” and “Zito I Ameriki,” rang out up and down the parade route. Once the churches passed, the Greek-American societies and organizations followed from the Pan-Ikarians, the oldest society in the United States, to the Hellenic Medical Society, one of the newest members. University Greek student clubs from the University of Pennsylvania, Drexel, Temple, and St. Joe’s, all participated. The Philadelphia Greek Basketball League featured a float with its members on it with “Franklin,” the Philadelphia 76ers mascot. Classic cars, motorcycles, and baby carriages followed along. Even the legendary retired wide receiver for the Philadelphia Eagles, Freddy Barnett, marched as an honorary marshal. As MC Harry Karapalides shouted out, “God must love the Greeks. He gave us a perfect day!” and it was truly a perfect day for the Greeks to honor those that fought for Greece’s freedom, not only in 1821 but to the present.